Are we too afraid to be worried about Zimbabwe? Zimbabwe has lived in the periphery of our vision. It is a taunt by those who have left South Africa and believe that we are headed along that path. Perhaps it is our fear that stops us engaging on the tragedy just north of us, writes Howard Feldman. Zimbabwe is a tragedy. The recent fuel increase of 200% has proven to be the final straw to break the proverbial economic back. The protests that followed have been dealt with in the harshest manner, with means utilised by the worst of dictators around the world. The internet was switched off, people have been shot and arrested and door to door searches have been implemented. Shops, schools and businesses have been closed, while the government sought to curtail a devastated and heartbroken people. The light of democracy that flickered briefly, has been extinguished. The South African government said hardly a word. When approached for an emergency loan of R16bn it stated that the country does not have that kind of money to assist. Treasury is right of course, but a word of sympathy, a gesture of kindness doesn’t cost much. I am often perplexed as to why the ANC and the department of international relations and cooperative affairs (Dirco) seem to be a lot less concerned about our neighbours on the African continent than they are about happenings further afield. The focus appears to be almost inversely proportional to the distance from the country. Zimbabwe, it follows, stands little chance of receiving any attention. This is not a new phenomenon. Former president Thabo Mbeki believed in “quiet diplomacy” when it came to Robert Mugabe and former president Jacob Zuma appeared to support him more than he did encourage him towards democracy. It is clear, that as its strongest economic neighbour, South Africa was in a position to assert some kind of pressure on the state. But it failed repeatedly to do so. There are a number of possible reasons that might explain this strange phenomenon. I initially wondered if it wasn’t that some form of internalised racism or colonialism was at play. The internalisation of racism, sexism or even antisemitism is sadly more common than we might think. I have written about the challenges faced by women in the South African corporate world (specifically black women) and have noted many cases where the perpetrators of sexism were in fact other women. I recall one specific case at a bank where a customer, a black woman, refused to deal with another black woman as her private banker. She wanted a white man to advise her on matters of finance. It mattered nought that the man was significantly less qualified or capable. Perhaps in this case South Africans have somehow accepted the colonial ideology that the events in Africa are of less importance than that of Europe or the United States. If so, we have some adjusting to do. Another alternative is maybe that South Africans have always lived in fear of what has occurred in Zimbabwe. From being the “breadbasket of Africa” it has become a country where people starve, where land grabs occurred at the behest of the president and where the denial of democratic rights of freedom of expression defines the country. Zimbabwe has lived in the periphery of our vision. It is a taunt by those who have left South Africa and believe that we are headed along that path. Perhaps it is our fear that stops us ever really focusing and engaging on the tragedy just north of us. The last and most cynical option is that it is simply not politically expedient to criticise the country because there is little to be gained from it. It is more important to show a united continent that to demand better behaviour from its leadership. We cannot forget that South Africa embarrassingly awarded safe harbour to Omar al-Bashir and will rarely comment on the denial of rights when perpetrated by other African states. 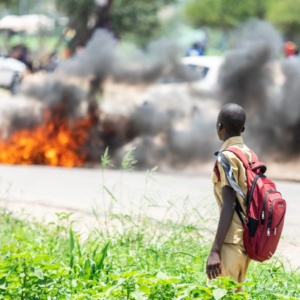 The most tragic part of the Zimbabwe situation is that it matters not one bit what the reasons are for South Africa’s disinterest. What matters is that the people of a country on our doorstep are suffering. And we don’t seem to give a damn. Subscribe to get updates right in your inbox. We promise to not send you spam. ---Carry On BaggageTightrope... Musings on Circus South AfricaSmile, Dammit!